Cabbage Tree, an old fave grower for cool subtrops ..
Dichroa versicolor the evergreen hydrangea ..
Shady beautiful from Jon & Terry at Cabbage Tree …useful evergreens flowering shrubs to less than 3m are always good to find. 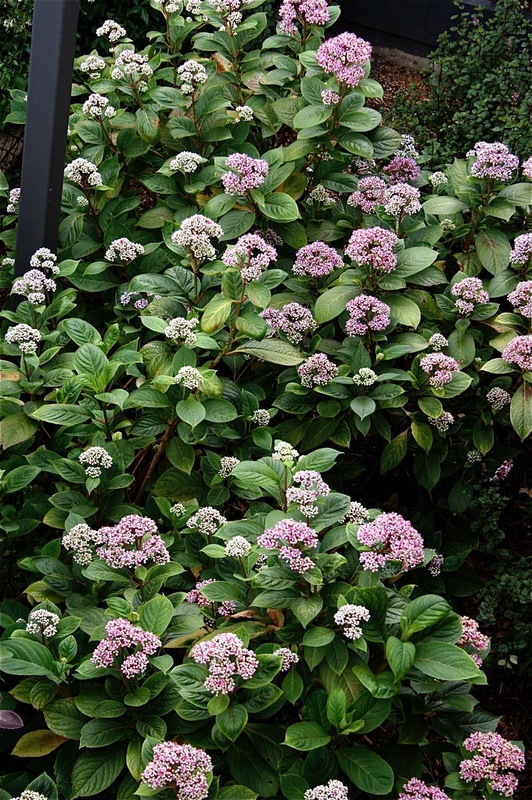 Especially ones like the Evergreen Hydrangea, Dichroa versicolor that favour the southern house side where they grow without losing condition during sunless winter months AND conceal the boundary fencing. 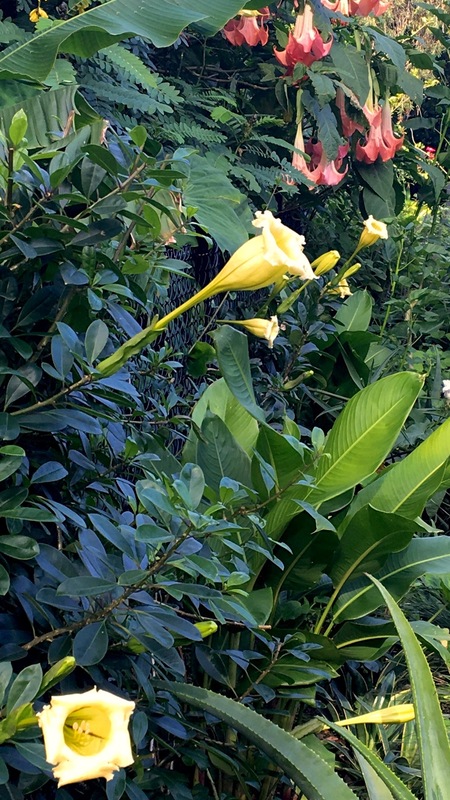 If shady evergreen shrubs are good to find, interesting climbers are scarce as hens teeth. Enter Solandra longiflora, little sister to S. maxima and an extremely useful subject for converting pvc mesh fencing to ‘green fencing’. ‘Green Fencing is where certain climbers that are flexible but woody enough to hold position, are woven loosely through mesh and effectively disappear into the garden but have the advantage of keeping your client’s dog and the neighbour’s dogs out. Garden variety bromeliads that make good garden plants are a low risk option for bright but dry shade. Virtually no maintenance or predation, Billbergia (‘Domingos Martins X ‘Ed MacWilliams’) ‘Hallelujah’ is high on this list and if you have a featured east facing spot for morning sun only, expect to be rewarded with stained glass winter colour through low angled sun light and flower flashes during any of the warm weather. Go on, make a garden from plants I dare you and call Jon or Terry now !!! Do you think that Dichroa would grow ok on the NSW South Coast? DGN is an industry read with currency on availability of interesting planting to make gardens from for Designers & landscapers. Did you know you can stay at “Sea-Changer”? "Sea-Changer" at Paradisus in Forresters Beach on the Central Coast is now open. Your ‘Clifton’ Masterclass ‘Leave a Reply’ response ..
Green Gallery for the best colour ..